London, November 17th, 1896: The streets of the city are almost deserted, traveled only by passersby whose only goal seems to reach their warm homes as quickly as possible. But in the private salons of a luxury Bloomsbury hotel, the goal is something completely different. The fifty greatest known mediums are taking part in a never-before-seen tournament in order to determine which one is the most powerful of all. The final table opens in a few minutes and you will be joining it. Who will win the £1,000 reserved for the winner? 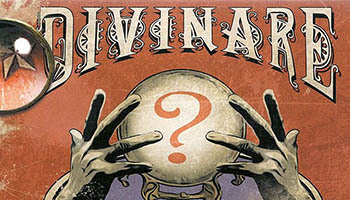 In Divinare - pronounced "di-vin-AH-ray", with the stress on the penultimate syllable - the players play the part of famous mediums who must attempt to divine the cards held by their opponents. 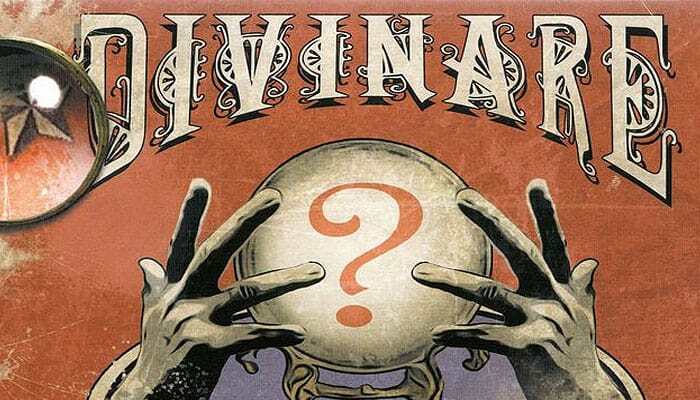 In each round, only two-thirds of the cards - representing the four divination methods of chiromancy, crystallomancy, tasseomancy and astromancy - are dealt out, and are then revealed little-by-little, giving the players the possibility of narrowing their predictions. A good prediction will allow the players to win points, but guess wrong and you may be forced to take a penalty. The player with the most points after a set number of rounds wins. The players play the part of mediums who attempt to divine the cards owned by their opponents. In each round, the cards are revealed little by little, which gives the mediums the possibility of narrowing their predictions. A good guess allows players to win points. The player with the most points after 4 rounds is the winner. Place the boards in the middle of the play area. Each player takes a character card and the 4 corresponding prediction tokens. Keep the score tokens close at hand. The oldest player takes the 4-player action card and will be the first player. The game can begin.